12" x 25", 2.0 lb./dozen, terry, 100% cotton cooling towel. Icy cool right out of the bag! How to use: Step 1 - Remove from package. Step 2 - Shake until completely unfolded. Step 3 - Place around neck and/or wipe down face and hands. Cooling lasts for hours and has a clean citrus scent. When removed from the packaging the towel will become significantly colder then the ambient air temperature. 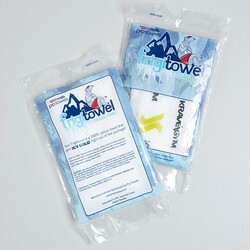 The cooling sensation is a one-time use, however the towel itself is reusable.